Summer is quickly approaching, and it’s time to hit the pool! 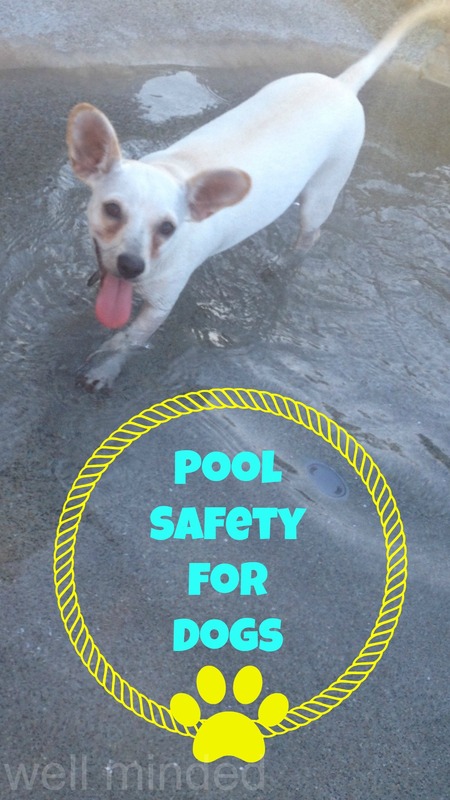 We think and talk all the time about pool safety for our children, but we may overlook the fact that if our dogs are around pools, they are in danger, as well. Pool safety for dogs is important. Wait. What? Don’t dogs naturally know how to swim? Yes and no. Unlike humans, all dogs are genetically programmed to paddle in water. It’s a survival skill, but it’s not “swimming.” Some dogs are naturals in the water, but some can’t swim at all. first thing’s first. who can’t swim? dogs with heavy heads: Perhaps the most important type of dog to steer clear of the water. Bulldogs’ heads, for example, will quickly sink to the bottom of a pool. So how can these types of dogs be part of the family pool party? If they are going to be around the pool, it’s important that they wear a life vest. There are vests made just for dogs in all shapes and sizes. Another great idea for cooling off is a kiddie pool. Just a couple of inches that your pooch can lie in is a great way to include him in the fun. If you have a pool and you have a dog, chances are, he’ll fall in at some point. He needs to know what do do. Whether you plan to swim with your dog frequently, or you’re simply wanting her to be safe around the pool, it is important to teach your dog how to get out of the pool. Your dog needs to know where to get out, whether it’s a graduated entry, steps, or ladder. Teach your pooch to swim there, first, and make sure she can get out on her own. If she knows where to go to get out and how to get out, odds are, even if she falls in unexpectedly, she’ll be able to navigate to that spot and get herself out. If she doesn’t know, she may struggle against a side of the pool she can’t get out of, eventually leading to exhaustion and drowning. There are special steps and ramps designed to make pool entry and exit easier for dogs, so if your pooch struggles with getting in and out of your pool, it’s wise to look into these options. Learn pet CPR. Though the idea is the same, pet CPR is quite different than human CPR. One basic difference is that CPR for dogs is done with the dog laying on it’s side. Pet CPR courses are offered, and it’s a great thing for any pet parent to take. I took mine at PetTech. Teach your dog to swim. Swimming can be great exercise for dogs in good cardiovascular health, so be sure your water-loving pooch knows how to do it right. One reason it’s important for your dog to know how to swim properly is so he is calm in the water. A panicked or fearful dog may bite if you try to assist him in the pool. If he’s calm and confident, he won’t panic. Some dog trainers offer swim lessons. We’ve all been told to wait to swim thirty minutes after eating to prevent cramping. Though that myth has pretty much been thrown out the window for humans, it holds true for dogs. Dogs–especially large breeds–are at risk for bloat if they swim on a full stomach. Allow your pooch time to digest her meal before swimming. Be mindful of underwater pool features. Dogs may jump onto features beneath the surface of the water such as built-in stools or platforms, which can result in serious injury, such as broken bones. It’s best not to have these types of features if your dog likes to swim, but, if that can’t be avoided, be sure to steer your dog away from these features. Also be sure to remove pool vacuums before allowing your dog to swim. Dogs can become tangled in the tubing and risk drowning. Though a refreshing splash in the pool can be great for water-loving dogs, hot tubs are a big no-no. Dogs can’t tolerate the heat of a hot tub. Remember that pool decks may become hot, especially during the summer months. If the deck is to hot for your feet, it is too hot for your dog’s feet. Be sure you provide an area of shade where your pooch can stand so he doesn’t burn his paws. Some dogs like to lap out of the pool, but chlorinated water isn’t really healthy for your pooch, especially in large quantities. Provide a fresh bowl of water next to the pool so your dog can stay hydrated. After you’re done swimming for the day, remove all toys from the pool. This includes dog toys as well as human toys. If left in the pool, they become temptations, especially for water-loving dogs. You don’t want your dog to try to reach a toy in the pool when he is unattended, so it’s best to remove these things to be safe. Wash and dry your dog. If your pool is chlorinated, rinse your dog of with the hose or a shower. Not only is chlorine a chemical that shouldn’t be allowed to sit on the skin, it can be very drying to your pet’s skin and coat. It’s also a good idea to dry your dog’s ears thoroughly after a swim to remove excess moisture and keep the ears healthy. Though there is a lot to consider regarding pool safety for dogs, swimming should be an enjoyable activity you can share with your pooch, and it is an excellent low-impact exercise because it puts very little strain on your pet’s joints. If your pooch loves to swim, go for it. A dog who doesn’t like the water should never be forced to swim. ​If your dog doesn’t like the water, it’s still important to teach basic safety such as where to exit if she falls in.